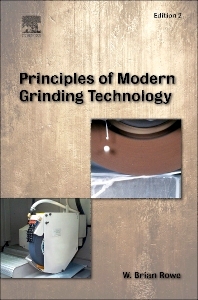 Principles of Modern Grinding Technology, Second Edition, provides insights into modern grinding technology based on the author’s 40 years of research and experience in the field. It provides a concise treatment of the principles involved and shows how grinding precision and quality of results can be improved and costs reduced. Every aspect of the grinding process--techniques, machines and machine design, process control, and productivity optimization aspects--come under the searchlight. The new edition is an extensive revision and expansion of the first edition covering all the latest developments, including center-less grinding and ultra-precision grinding. Analyses of factors that influence grinding behavior are provided and applications are presented assisted by numerical examples for illustration. The new edition of this well-proven reference is an indispensible source for technicians, engineers, researchers, teachers, and students who are involved with grinding processes. W. Brian Rowe is a consulting engineer and recognized bearing expert with more than 30 years’ experience working on a wide range of machinery design problems across all industries. He has previously run courses on bearings at Coventry University in the UK and Stanford University in the USA, as well as sessions on the topic for industrial engineers in Chengdu, China. He has received awards in recognition of his work, including the Walter R. Evans Award for significant contributions to the field of rotor dynamics in 2004.